Home > Travel > Flight > Budget Airlines > Scoot: Extended Take Off Tuesday with Fares from $99 to 20 China Cities & Many Other Destinations! Book by 23 Oct 2018, 2359hrs Scoot: Extended Take Off Tuesday with Fares from $99 to 20 China Cities & Many Other Destinations! Hold the door and step out for your year-end getaway! Brace yourselves as this week's Extended Take Off Tuesday destinations will take you on a colourful holiday through spring, autumn and winter. Scoot to 20 China cities from only $99! Other destinations include Athens, Melbourne, Tokyo, Bangkok, Phuket, Honolulu (Hawaii) and more. Set your alarms for 7am tomorrow! 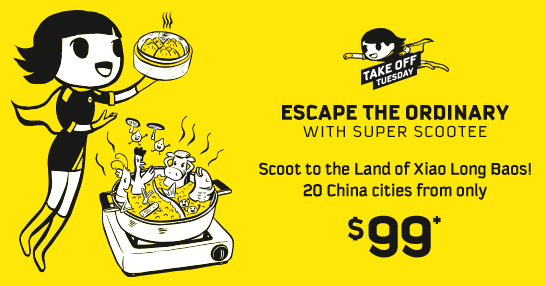 Promotion: Scoot Extended Take Off Tuesday with Fares from $99 to 20 China Cities & Many Other Destinations! Next: Popeyes: NEW Coupon Deals + Get 5pc Chicken for only $6.90 on Popeyes Day!